The Greeks with their dark, sharp eyes and stoic expressions regarded us as though we were crazy. We danced down the sidewalks of Heraklion, singing. 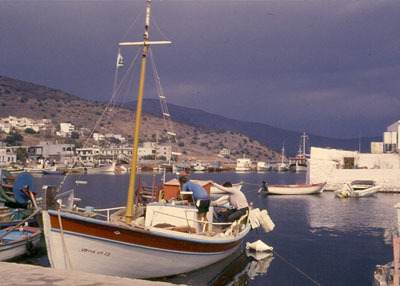 Before us was the port, leading to Santorini, the islands and all parts north in the blue-green Aegean. 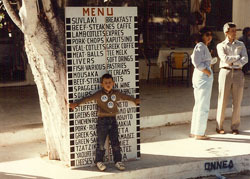 Behind us, the sun-drenched hills of Crete and the road to Knossos. ‘We’re having….Pastitsio!’ we sang and, laughing, fell together in an embrace as only newlyweds in a new land can do. A leather-skinned man brought his Ape to the curb nearby, pulled off his fisherman’s cap, and lit a cigarette. He shook his finger at us, but his sly smile and the twinkle in his eye told me he was remembering. To save some drachma, we’d taken the local bus to Sir Arthur Evan’s palace, and to save some more we’d walked the whole long way back along a dusty road lined with aloes and olive trees. It was idyllic: warm October sun on our shoulders, smiling grandmas in their black shawls tending to chickens, the occasional braying donkey tethered to a tree. We were young. And we were hungry. ‘Pastitsio. Yes, good.’ The waiter gave a firm nod of his head as he took back our dog-eared menus. And he was right: it was good, a sort of cross between moussaka and lasagna, made with long hollow noodles into a casserole. As we ate, although I tried desperately to resist the urge, I remembered a Chef Boyardee ad, with kids marching along an Italian street. ‘We’re having pastitsio,’ we sang as we left the café to catch our bus. We danced arm in arm down the street while the warm sun glowed and the sea glistened like a jewel and the Greeks all turned to stare. Note: My rendition of pastitsio has three layers of noodles, with layers of meat sauce in between, the whole of which is covered thinly with béchamel sauce. The bottom two layers of noodles are each ‘set’ with a beaten egg mixed with some cheese. You can buy Greek pastitsio noodles from specialty stores like Pacific Food Importers, here in Seattle. 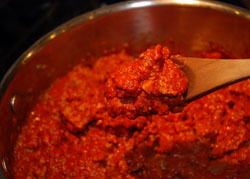 Make the meat sauce: Saute the onion in 2 teaspoons olive oil for a few minutes in a 12” skillet over medium heat, crumble the lamb into the mixture and brown for 10 minutes, chopping the meat with kitchen scissors to make the lumps of meat as small as possible. Add the chopped garlic and sauté a further 5 minutes. Remove as much fat as possible and discard. Add the next 6 ingredients, bring back to a rolling simmer, and cook gently for 15 minutes. Cook the noodles: Bring 5 – 6 quarts of water to a boil, add the pastitsio noodles and boil for 6 minutes. Drain, and run some cold water over the noodles to stop them cooking. Line the pan: Spread 1 ½ tablespoon butter onto the inside of an 8 x 12 lasagna pan (or a 9 x 13 pyrex pan) and then coat with 3 tablespoons of bread crumbs. Build the layers: Distribute 1/3 of the noodles onto the bottom of the pan, spreading evenly (don’t worry about the noodles being aligned). Mix 1 egg with 2 tablespoons parmesan or pecorino and toss over the noodles. Spread half of the meat sauce over the noodles, add another 1/3 of the noodles and repeat the egg and parmesan topping, and then the other half the meat sauce. Spread the other noodles and proceed to the béchamel. Make the béchamel: Heat 3 tablespoons of butter in a small saucepan until melted but not browned. Stir in 4 tablespoons of flour to make a roux, and add ¼ cup milk. When the milk is bubbly hot, stir to incorporate and then add another ¼ cup milk. Let bubble and incorporate. Repeat twice, each time allowing the milk to reach optimal heat before incorporating, stirring all the while. Add last ½ cup milk and let come to a simmer. Turn off heat. Beat 2 eggs in a separate bowl, add a small amount of the hot roux and beat in. Continue beating, add another portion, and continue, beating in additional amounts until all of the hot roux is incorporated. Finish and bake: Pour the béchamel sauce over the noodles and meat sauce, smooth with a spoon, and sprinkle the 4 tablespoons parmesan or pecorino over the top. Finally, sprinkle with the nutmeg. Bake finished casserole in a 375º oven for 35 – 40 minutes. Baking in a woodfired oven: I originally meant for this to be a woodfired event, but the weather in Seattle this past week has occasioned several levels of burn bans. Under these conditions, any particulate matter my woodfired oven produces will hang in the air. I take these warnings seriously, and hope you understand my omission. When I post a similar recipe in future, I will amend this post to suit. Thanks for your understanding! Ooooooh yummmmm. I could eat that picture right up! I love pastitsio and haven’t had it in a long time! I must make it very soon, yum! wow, amazing photo! this recipe sounds delicious. I’ve not had the pleasure of trying Pastitsio, but will definitely have to now. Such a nice presentation! Very creative . I bet it’s tasty too! This is warming my Minnesota-winter heart… and bones. I haven’t had this dish in years and would like to fix that. Looks very good Don – kind of cute little Os actually. I like the lining of the pan with butter and breadcrumbs too. I’ll have to remember that. 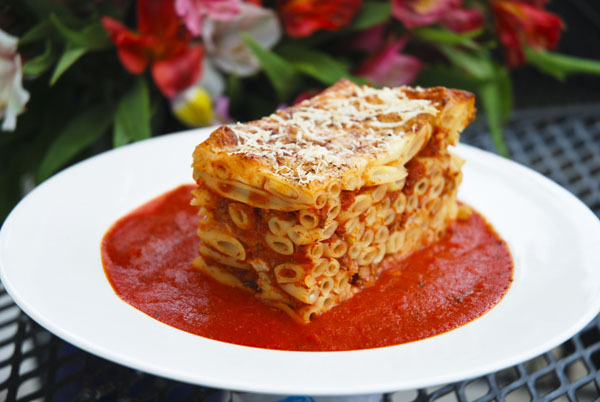 What an interesting dish…like how the pasta is layered Very nice presentation…and great pictures as well! What a beautiful and impressive dish! I love the flavors of lamb, cinnamon, and nutmeg – what a warm, comforting combination. This looks fantastic and no doubt was a tasty experience! Bravo! I love this recipe and the way it looks. What fun! Thanks for sharing. This looks fantastic! I could use my leftover béchamel sauce that I made for lasagne to make this. YUMMMMMM!! What a lovely story, too! Thanks for sharing this recipe. I love Greek Noodles and really feel hungry now! You are full of talents. This looks iNCREDIBLE. I saved it! As an admitted carbo lover, I am drooling over this dish. The lamb makes it doubly good. Pastitsio in Greece is a traditional meal, can be eaten warm or cold with a frozen glass of beer…!!!! Enjoyed reading the post. I am currently working on my frozen yogurt site at. In fact I got some great design tips from Pastitsio: Classic Greek Noodles | Sortachef. Looking forward to reading more.